I particularly want to thank my Spanish professor, Mrs. Carol Christian. She gave me the support and encouragement that led to my discovery of mistranslations of Spanish documents from the sixteenth century. Many scholars have invested their time and efforts in the translation of these very difficult sixteenth century Spanish documents. Dr. James Lavin devoted countless hours to painstakingly translate the entire deposition of "one Pedro Diaz Franco". (See Addendum IV for Dr. Lavin's translation.) The copies of the 400-year-old document we received were extremely difficult to read as the ink from the back side bled through to the front side. This research was first started in 1998 with the encouragement of Dr. Charles Ewen and Dr. E. Thomason Shields. The preliminary research on the original Port Ferdinando paper (The Roanoke Sagas) would not have been written or published without their help. This paper will examine the problems involved in doing historic research. A hypothesis is nothing more than an educated guess based on the evidence from the compilation of historic narratives, court documents, maps, oral histories and archaeological findings. Locating primary sources can be daunting and problematic as this paper will document. This author was researching documents relating to the presumed fort site on Roanoke Island concerning the Sir Walter Raleigh's voyages of 1584-1600 and the enigmatic and well-documented "Lost Colony". Working from sources touted as the best scholars of the twentieth century, this author framed and presented some new and interesting questions or problems about the fortification located at the North end of Roanoke Island and the location of the relic Inlet of Port Ferdinando. Working from published Spanish documents from 1618/1931 (Ore, P. FR. Jeronimo De) and translations of this document from 1936 (Geiger, Dr. Maynard) and 1951 (by Irene Wright), discrepancies appeared in the narratives and documents as written and translated by the three above authors. The documents in question are regarding two accounts of the Spanish discovery and reported location of the English outpost at Roanoke Island and Port Ferdinando. Captain Vincent Gonzalez in 1586 and Pedro Diaz Franco in 1588 both discovered the secret hiding place of Sir Walter Raleigh's "Roanoke Ventures" and rushed back to Havana to report their findings. It was discovered that many of the accounts regarding the above inquiries were taken from an original primary document, which appeared to be a deposition taken in Havana, Cuba and was a possible first-hand account by one Pedro Diaz, from March 21, 1589. Both of the Spanish accounts referenced the English location. The translations raised many new questions that have been scrutinized by four new expert Spanish "Golden Age" scholars. The Outer Banks of North Carolina constitute a geographic feature known throughout the world. As one of the first mapped and studied areas in North America, it continues to be researched today. Understanding ocean currents, sand movements and the dynamics relating to this attenuated sand ribbon and its environs, including the Pamlico and Albermarle sounds and relevant portions of the mainland, remains a major challenge at this time (Willard 2004). The same dynamics of the shifting Outer Banks that challenge geologists also challenge those researching and looking for archaeological sites connected with the 1580s English voyages to the area. Although solutions to the mysteries surrounding the Roanoke sagas and the lost 1587 John White colony have been sought for more than four hundred years, investigations have been hampered by a great deal of misinterpretations and confusion. Roanoke Island has attracted many historic and archaeological studies related to the 1580s English expeditions, in particular the Fort Raleigh area. While the town associated with John White's colony has never been found, a few artifacts do connect the Fort Raleigh Island site with the 1585 Roanoke voyages (Stick: 237; Hume: 89). My interest in Spanish documents was first aroused when I discovered that one of my research projects (Port Ferdinando and the propertied sixteenth century English fort on Roanoke Island) had sixteenth century primary Spanish accounts that had survived in the archives for over four hundred years. The Spanish were very eager to find where the English had settled on the coast of North America. The fleets of Sir Frances Drake and Sir Walter Raleigh were plundering the Carribean shipping and towns for gold, silver and other valuable commodities. 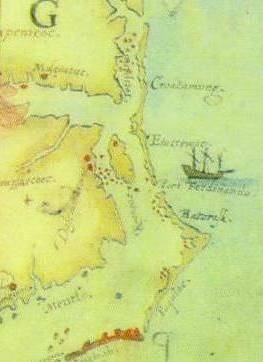 Roanoke Island and Port Ferdinando provided a well-hidden base of operations for the English. Based on the reported Spanish discoveries, I developed a working concept that the undiscovered "Port Ferdinando Inlet" was near the present day Outer Banks just south of Nags Head, North Carolina. In addition, the fort locations on Roanoke Island were documented by these Spanish accounts and could provide possible new information. Fortifications have been a central feature of the "Roanoke Ventures" and confusion caused by secondary reports and accounts that were not primary documents have accounted for most of these problems. Starting with the 1585-86 colonization attempt led by Sir Richard Grenville and Ralph Lane, forts had been built in at least six, and possibly seven, locations (Powell 1989: 45; Hulton 1984: 5,15,41,42,173-4). Ralph Lane built two in the Carribean in 1585 (drawings of these two forts are published in Hulton: 1984). Lane constructed a large fortification at Port Ferdinando (It is Lane who first writes of a fort at Port Ferdinando in his letter of August 12, 1585: "To Ye Right Honorable Sir Francis Wallysngham Knight". And signed: "From Ye Porte Ferdynando, in Virgina"). As many as three more forts may have been constructed on Roanoke Island. John White's primary narratives indicate that two small "alarm" forts may have been built on Roanoke Island, one on the north end and another at the site where their small boats were kept (White 1587-Quinn 1955:524). "From thence wee went along by the water side, towards the poynt of the creeke to see if we could find any of their botes or pinnisse, but we could perceive no sign of them, nor any of the last Falkons and small Ordinance which were left with them" (White 1600-Quinn 1955: 524,615). White is describing a harbor where boats are moored and the town is very near. He also indicates that there is a fortification on the North End of the island where Lane's soldiers are stationed When White left to return to England to bring back needed supplies in 1578, the town of (The City of Raleigh) was not fortified. The town was "palisaded very fort like" (Quinn 1955:614) after John White returned in 1590. White, in both 1587 and 1590, said we intended to move and build our town and new fort 50 miles west of Roanoke (Quinn 1955:533,613). The above accounts seem to represent seven different sixteenth century forts in the new world, with five of them here in North Carolina. If the reconstructed Roanoke Island fort is seventeenth century (as most scholars now agree), not one trace of these forts has ever been found. Even with so many possible locations of sixteenth century fortifications, their discovery and or verification remain a heated and confusing mystery. The location and size of the fort that J. C. Harrington reconstructed in the early 1950s on Roanoke Island tend to refute the possibility of it being built by Ralph Lane in 1585 (Hume 1994:88-89; Quinn 1995:909). However, for years this fort has been attributed to Lane. Ralph Lane did build a small fort on the north end of Roanoke Island, but according to the eminent archaeologist Ivor No�l Hume, it is not "The new fort in Virginia" (from the signed letter of Lane from August 1585) as the monument placed in front of the fort recites. Most scholars now have accepted my original hypothesis that Lane did build a fort at Port Ferdinando. The culmination of this study is that the fort site long touted and designated as Ralph Lane's "A new fort in Virginia" located on the north end of Roanoke Island is not the correct location. The fort mentioned in documents was always associated with the short lived City of Raleigh (1585/1590). The original Pedro Diaz Franco document relating to this location has resided in the Archivo de Indias in Seville, Spain for over four hundred years and has only been translated by one Spanish scholar some fifty years ago (Irene Wright: 1951). With the help of four new Spanish scholars, who include Dr.Rich from Elizabeth City State University, Dr. James Lavin, a "Spanish Golden Age" specialist and Professor "Emeritus" at The College of William and Mary, and his replacement, Dr. Lucas Marchante, who is also a "Spanish Golden Age" specialist and Associate Professor of Spanish in the Department of Modern Languages and Literature at The College of William and Mary. We also received some independent help from the Spanish Department at East Carolina University in obtaining a copy of the original Spanish document from Seville, Spain. The consensus of all of these experts involved is that a possible new location for the fort and the lost "City of Raleigh" on Roanoke Island may be indicated. (See newspaper article from the front page of the Virginian-Pilot, February 3, 2005). The Spanish translation about Captain Gonzalez's discovery of Port Ferdinando started a very intense map study and study of the known literature. This eventually led to a hypotheses and a published paper about this possible location on the Outer Banks of North Carolina. 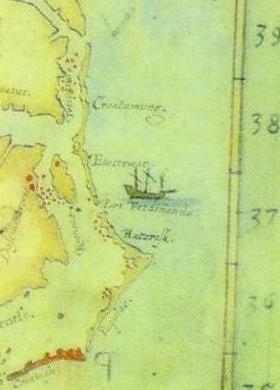 This hypothesis also includes the proposal that the Ralph Lane fort mentioned in most of the historic records (The new fort in Virginia), relating to the 1585 Colony, is actually on the Outer Banks near the existing Bodie Island Lighthouse and not on the North end of Roanoke Island as reported for the last few hundred years (Sams 1924:26; Quinn 1955; Stick 1983). (See the John White map B). The paper about Port Ferdinando was recently presented at an academic symposium. It was well received and this past spring the paper was published. It was there, at Port Ferdinando where the construction of a large defensive fortification took place with a ship repair facility, and wells were dug. The retranslation of the original Spanish documents however calls into question some of the original findings about the Gonzalez and Diaz account of the fort and its location. It was also at Port Ferdinando that the Spanish expedition of Captain Vincent Gonzalez reported finding in 1588, while searching for the English colonists, a "varadero", or shipyard, and "pozos hechos de pipas", English casks or wells and other debris, indicating that a considerable number of people had been at this location (Quinn, Set Fair For Roanoke:307-309). This area was also used as both an observation post and a campsite. (We have from these Spanish sources a sighting of sloops or a place to service "chalupas" one year later than any account of the Lost Colony, which was sighted by the Spanish Captain Gonzalez in 1588.) It was at this location (Port Ferdinando) that Gonzalez concluded that he had finally found the "Secret English Outpost" and it could be no other than the location called by the Spanish as "Jacan" (the territory named by the Spanish north of Georgia and nearby, and sometimes referred to as the Chesapeake Bay and coastal sounds nearby, now called the Outer Banks of North Carolina). (Willard: 2004, Quinn: 1955). According to the Spanish manuscript published in ca.1617, the Pedro Diaz Franco's and Captain Vincent Gonzalez's depositions are probably one of the few firsthand accounts of the location of Port Ferdinando and of Ralph Lane's wooden fort on Roanoke Island. To the questions as to why Diaz has not seen the settlement from the ship, even though they had reached the place where the wells were, he answered "It was not possible to see it since it was ten leagues (30 miles) away on the arm of the sea bearing away from the northern opening into the harbor." "...On the island (Roanoke Island) they have a wooden fort of little strength and it is on the inside by the water." "In the said fort he (Grenville was the commander of the English expedition) left eighteen men, (the English accounts all indicate fifteen), and did not allow the said Pedro Diaz to go on shore or to enter the fort." "...And left in the said fort four pieces of artillery of case iron" (Quinn 1955:786-796,812). The above translation was the work of Irene Wright in 1951. This translation was not afforded the careful scrutiny of the four new Spanish scholars. A seventeenth century dictionary was used to correlate the document with the language in use at the time (See Addenda). There were several editions of Pedro Diaz's account. The "Relaci�n hist�rica de la Florida, escrita en el siglo XVII by P. FR. Jer�nimo de Ore": first published in ca.1618. (We later discovered the source that Ore was using: The 1589 original document in Seville, Spain and with the hekp of many people had it copied, sent to us and retranslated). Esta misma noticia se tuvo por aviso de la Habana de un piloto, Pedro Diaz Franco, que el Puerto atr�s referido de la altura de 35 grados y medio, adonde se vieron los pozos en las pipas inglesas era donde estaba la poblaci�n del Ingl�s, y que a el le habia llevado dos viajes, y que a la saz�n tenia como trecientos (sic) hombres y veinte y tantes Mujeres. Habi�ndosele preguntado como no habian visto la poblaci�n desde el barco, habiendo llegado al pasaje de los pozos, dijo que no se habia podido ver, por esta diez leguas por el brazo arriba, de la boca de la banda del Norte de aquel puerto, y que se procuraban encubrir hasta haber descubierto buena tierra para poder poblar y fortificarse. ...y assi allaron la dha ysia despoblada y a un yngels y un yndio aorcados y de los naturales no allaron mas de tres yndios de essos trayendolos alos navios se huieron los dos y el otro fue presso de quien se tomo relacion de como Fr(co) draque havia llevado La gente que avia en la dha ysia y en ella tienen un fuerte de madera, de poca fuerca queda dentro del aqua y ay abundancia de madera, la tierra arenisca y anagadiza y Pantanosa, de la tierra firme no save el dho Pero diaz la calidad della mas de que paresce fertil y de grandes arboledas. En el en el dho fuerte dexo 18 hombres y no dexo saltar en tierra ni entrar en el fuerte al dho P(o) diaz, estubo alli el dho Cap (an) 14 dias y quedaron en el dho fuerte 4 P(as) de artilleria de yerro colado y bastimento para los 18 para un ano y por cavo (?) dellos a un m(e) cofar yngles a otro llamado Xapeman. Applying the scientific methods of archaeology to the Bodie Island location may help solve the problem of primary access, that is, where over time it would have been most likely that ships would have used other inlets to reach Roanoke Island rather that Ferdinando Inlet. Some historians chronicle Trinity Inlet (twenty miles to the north) rather than Ferdinando Inlet as the inlet of choice among the Roanoke colonists, but the idea of Trinity Inlet as the primary access to Roanoke Island has now fallen out of favor (Willard: 2004). The Spanish documents helped to clarify this problem of "Where is the relic inlet of Port Ferdinando" which closed some time just before 1808. Narratives, published papers and letters of Richard Grenville, John White, Sir Francis Drake, Arthur Barlow and 1586 and 1588 Spanish depositions all indicate that Ferdinando Inlet was the primary entrance to Roanoke Island in all the "Roanoke Voyages". It provided both passage and anchorage (Quinn, Roanoke Voyages:94-95,106-8,107,191-2,198,202-204). The publication of this paper was the highlight of my academic studies until I discovered that the 1618 Ore edition of these accounts was not the primary source. A reference was found to an original document that was reported to have been the deposition of Pedro Diaz in 1589. The most important lesson I have learned about research is to always allocate the most validity to the primary or original document over any later edition, translation, rendition, or second-hand report. "And so they found the Island deserted (Roanoke Island), and they found an Englishman and an Indian who had been hanged. Of the Natives they found only three, and as they were conducting these to their ships two escaped. The other was held prisoner, and of him they learned that Frances Drake had taken away what settlers there were in the Island." (In June just a few weeks before Pedro Diaz arrived at Port Ferdinando in 1586) "They have there a timbered fort of no great strength, which stands in the water. There is an abundance of timber. The soil is sandy wet and swampy." (It is here that Wright takes great liberty with punctuation, sentence structure and reconstruction of the intent of the location of the fort in the original Spanish document.) Dr. Lavin has translated this last passage as "...bringing them to the ships (the three Indians), two fled and the other was kept as a prisoner, from who was taken the account of how Francisco Drake had taken away the people who were on the Island and on it they had a flimsy (of little strength) wooden fort and (it?) is in the water (esta dentro el agua) (possibly indicating a moat) and there is an abundance of wood, the soil sandy, wet (anegadiza, an adjective invented from the verb anegarse, equals flooded) and pantanosa (either marsy or swampy)." Dr. Lavin thinks this all could be related to the location of the fort. It is well documented that the fort is located very near the "City of Raleigh". As this is an interpretation not an absolute description of the fort location much caution about this research is needed. What is exciting about this new possibility is that millions of dollars have been spent in the acquisition and development of the Fort Raleigh site on the north end of Roanoke Island. All of it was proffered as the City of Raleigh based on the Pedro Diaz translation. There has been no trace of the "Lost City of Raleigh" ever found on the north end of Roanoke Island, although approximately 40 archaeological excavations have been attempted in the last 80 years. If the new rendering of the Diaz account is accurate, one probable location for the City of Raleigh is in Shallowbag Bay or downtown Manteo. When fitting the rest of the primary narratives into this new scenario, many of the old problems as to the location of the fort and City of Raleigh may be resolved. Manteo is the only probable location for the colonists to harbor their boats. It has never made sense that the town would be removed 8 miles from where their boats could be safely anchored. This logical village location model is used for all of the coastal Indian towns. Wingina the Indian King of Roanoke gave them the island and the old Indian town, which can be clearly seen on some of the maps is depicted right next to Shallowbag Bay. A hypothesis is just a "good guess" and if that is all that has been accomplished with this research and findings, I'm totally statisfied. Now the real work begins!!! Arana, Pedro de, The 1589 deposition of Pedro Diaz. Archivo de Indias, Sevill Spain (AGI). Covarrubias, Sebastian de- Tsoro de la Lengua Castellana o Espanola. (segun la impression de 1611) Barcelona: 1943. 1 De Ore, Luis Jeronimo: Relations of the Martyrs of Florida, "donde se an fortificado los Ingleses". Circa 1617, Madrid [? ], Reprinted in 1931/3, Edited by P. Atanasio Lopez, XVII, 2 vols. Geiger, Dr. Maynard: Translation Of (Franciscan Studies, no.18), New York, Joseph F. Wagner, 1936. Lavin, James PhD. The Retranslation of Pedro Diaz�s Deposition. College of William and Mary, Emeritus: Department of Cultural History �Spanish Golden Age Scholar�. An unpublished retranslation of The Deposition of One Pedro Diaz Franco from 1589. Quinn, David Beers: The Roanoke Voyages. 2 vols. : 1955, The Hakluyt Society Second Series 104-05, London, The Hakluyt Society. Quinn, David Beers: Set Fair to Roanoke: Voyages and Colonies, 1584-1600. The University of North Carolina Press, Chapel Hill, NC, 1985. Willard, Fred L, Barbra Midgette, E Thomson Shields (Edited by Charles Ewen). �The Roanoke Sagas, Searching for the Roanoke Colonies�. Published by the North Carolina Department of Cultural Resources, the Office of Archives and History; 2003 (A collection of Essays-1993 Roanoke Symposium/1998 Roanoke Conference). Wright, Irene A., B. A. F. R. Hist.S, Further English Voyages To Spanish America 1583-1594 printed for the Hakluyt Society, London England, 195. 1498, Map of the voyages of John and Sebastion Cabot. 1545, Alonso de Santa Cruz. 1545, Anonymous, Atlas of The Hague. 1567, Alonso de Santa Cruz. 1580, Simon Fernandes - John Dee. 1582, Humphrey Gilbert - John Dee. 1585, The 1585 sketch map (Anonymous, but may have been drawn by John White). 1585, John White Manuscript Map A,.map of Raleigh's Virginia. 1585, John White Manuscript Map B, map of Eastern North America. The only map or copies of it that name and locate Port Ferdinando. This map was not published until 1909. 1589/1631, Theodore deBry print of John White's Manuscript Map A, map of Raleigh's Virginia. 1599/1631, Theodore deBry print of "The Englishmen's Arrival", Mercator/ Hondis. 1609, Zuniga #1 (John Smith may have had something to do with this map. See edited Zuniga map by Sams. This is the most important map about the "Lost Colony" that has been found to-date. Very little research has been done with this primary source.). 1609, Zuniga map, transliterated by Sams. 1609, Ould [sic] Virginia #2, John Smith. 1701/1709, John Lawson, (Surveyed in 1701?). 1879, U.S.C. & G.S., Oregon Inlet Chart #138. 1958, Dunbar Map of Historic Inlets of the Outer Banks. 1983, 1983,(1849/1980) Shoreline Movement (North Carolina Outer Banks, published 1983). 1992, 1992,Soil Survey of Dare County, North Carolina issued by U.S. Department of Agriculture Soil Conservation Service. Chambers, Samuel: Personal Communication. 1999/2000, Geology Department (Satellite Imaging), Elizabeth City StateUniversity, Elizabeth City, NC. Coates, Donald R.: Coastal Geomorphology. 1972, State University of New York, Binghamton, New York. Cummings, William P.: The Southeast in Early Maps. 1955/1998, The University of North Carolina Press, Chapel Hill, North Carolina and London. Everts, Craig; Jeter Jr., Battley; Gibson, Peter N.: Shoreline Movements. Spingfield, VA, National Technical Information Service, 1983. Fisher, John: Geomorphic Expressions of Former Inlets along the Outer Banks of North Carolina. 1962, unpublished Master's Thesis, The University of North Carolina, Chapel Hill. Gares, Dr. Paul: Snapshots of the Carolinas Landscapes and cultures; Shoreline changes along the Cape Hatteras National Seashore, and Personal communication and lecture notes. Geography Department, East Carolina University, 1988,1989. Hume, Ivor No�l: The Virginia Adventure: Roanoke to Jamestown: An Archaeological and Historical Odyssey. New York, Knopf, 1994. Hulton, Paul: America 1585. The North Carolina Press, University of North Carolina, Chapel Hill, North Carolina, 1984. De Ore, Luis Jeronimo: Relations of the Martyrs of Florida �donde se an fortificado los Inglese�. Madrid [?]. Reprinted in 1931/3, edited by P. Atanasio Lopez, XVII, 2 vols. The translation is by Dr. Maynard Geiger (Franciscan Studies, no.18), New York, Joseph F. Wagner, 1936. Powell, William: North Carolina Through Four Centuries. The University of North Carolina Press, University of North Carolina, Chapel Hill, 1998. Riggs, Stanley: Personal communication and lecture notes. 1998, Geology Department, East Carolina University, Greenville NC. San Juan, Francisco: Personal communication. 1999/ 2000, Geology Department (Satellite Imaging), Elizabeth City State University, Elizabeth City, NC. Quinn, David Beers: The Roanoke Voyages. 2 vols., The Hakluyt Society Second Series 104-05, London, The Hakluyt Society, 1955. Quinn, David Beers: Set Fair to Roanoke: Voyages and Colonies. 1584-1600, The University of North Carolina Press, University of North Carolina, Chapel Hill, 1985. Sams, Conway: The Conquest of Virginia: The First Attempt. Spartanburg, South Carolina, Reprint Co., 1924. Smith, John: Travel and Works of Captain John Smith: President of Virginia and Admiral of New England, 1580-1631. Ed. Arber. 2 vols., Edinburgh, John Grant, 1910. Stick, David: Roanoke Island: The Beginnings of English America. University of North Carolina Press, Chapel Hill, North Carolina, 1983. 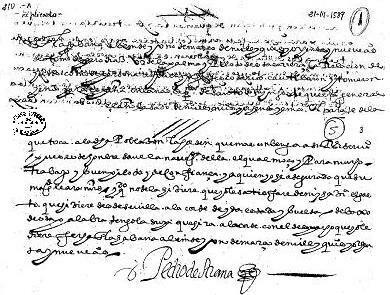 The 1589 deposition of Pedro Diaz was taken personally in Havana by Pedro de Arana whose official capacity is not stated in the document. Unlike the majority of depositions, this one is redacted in the third person and gives the impression of being paraphrased in sections where one might have hoped for greater precision. However, it probably served the purpose which is stated on its outer fold: Account of � where the English are settled on the coast of Florida at the latitude of 36 degrees �. This focuses the reader on pages two and three (1v and 2r) of the manusc on pages two and three (1v and 2r) of the manuscript. In the upper left corner of the first sheet appears the word triplicado written in a later(?) hand. The fact that the present document may not be the master copy opens the possibility that two other copies could differ in certain details. In fact, Quinn�s translation contains passages which do not appear in the present one, i.e., the reference to Grenville�s wife (Quinn, II, 787) which suggests a different copy. Also, a copyist confronted with a passage whose content was unintelligible to him might fake it and produce a �corrected� but incorrect sentence. Punctuation in the Diaz document is casual when present. In fact, it is virtually nonexistent. Lorenzo�s Spanish transcription contains only the most obvious modern punctuation � commas, periods and accents � although these are all absent in the original. I have retained these because they are well done and assist in comprehension. However, in a few instances it was impossible for either of us to supply proper punctuation. In my translation I have chosen to approximate the original as closely as possible, letting the ambiguities fall where they may. The photocopy of the original from which I worked has no identification other than the stamp of the Archivo de Indias in Seville (AGI). Quinn (1954) identifies his copy as AGI 54. I. 34, Santo Domingo, the same document cited by Wright (1951). This does not appear to be the same copy as the one I translated for the reason I mentioned above. Wright states that she relied on Quinn for clarification of certain Spanish renditions, which could mean that her abilities in Spanish were limited, if existent at all. At the same time, she gives no credit to a translator. Likewise, Quinn mentions no paraphrasing and Quinn is preoccupied with giving a rather ordinary rough account a more literary feel. Also, Quinn seems to have done excellent historical research. Diaz�s statement was taken in Havana and one copy would logically have been retained there. A copy or copies would likely have been included in the �dispatch� he was to carry from Arana to �court.� His destination was Seville, and he would have turned over at least one copy to the Council of the Indies there. There must have been other papers from Arana since he seems to have wanted them taken directly to the �court.� In 1589 this would have been wherever Philip II was in residence; Madrid, the Escorial, Valladolid or Toledo. Diaz�s travel from Seville would have been at his own expense, and thus Arana expects the king to reimburse him. The previous year of one thousand five hundred eighty five, en route from Bermuda was the Queen�s ship called The Tiguere on which there came as its captain a high-ranking English gentleman named Sir richarte Granfil who was in this(?) year on the island of Puerto rico and on ysauela where he [rreegato (for regate�, bartered?) � this is Quinn�s word, but it is the closest probability] for livestock, horses and Dogs with which to populate the coast of florida, from which he left leaving behind one hundred men and livestock, mules (sic) and Dogs and he [Diaz] was always kept with them so that he could not escape from them until the first of may of 88 in the following manner. Only map indicating Port Ferdinando where Pedro Diaz was anchored. They fought valiantly with the result that the Englishmen returned to the ships, which [ships] the following day returned to land to level the site with artillery from which the people on land suffered no harm because of the care they took and defended themselves until midday when the English[man?] took sail and his ships went on to Florida, where he (Singular for generic Englishmen, or an individual?) had left the people at the latitude [altura] of 36 grados � which farther than the bay [?] of Santa Maria to the northeast about 30 leagues to the cape [cauo] of San Juan, from where the coast goes north-south 12 leagues where the aforesaid settlement [poblaci�n] is which is an island that is attached to the mainland which [island?] must be about six leagues long and between the mainland and the island one can go on foot. The island used to have/had indians, with whom the mainland indians fought (warred) to whose cause they (the island indians) accepted the English of whom the mainlanders killed some four and those remaining Francisco Draque had taken(,) finding them confused and badly in need of food, the land being devoid of any, there being nothing other than corn [mays maiz] and little of that, and the land barren. And thus they found the island unpopulated and one englishman and one indian hanged and of the natives they found no more than three indians and of these, bringing them to the ships, two fled (L. has read this siguieron = followed; I read siguieron [se huyeron] = fled. This makes more sense in context � and also agrees with Quinn.) and the other was kept as a prisoner, from whom was taken the account of how Francisco Draque had taken away the people who were on the island and on it they had a flimsy [of little strength] wooden fort and [it?] is in the water (est� dentro el agua = �est� dentro del agua? Possibly indicating a moat? Since there is no pronoun, I am presuming the person of the verb refers to the nearest noun, i.e., fort.) Quinn elaborates on this : n. 6, p. 790, also pp.903-10, Dover, vol. 11) and there is an abundance of wood, the soil sandy, wet [anegadiza, an adjective invented from the verb anegarse = to flood], and pantanosa (either, marshy or swampy). Of the mainland the aforesaid Po Diaz knows nothing of its character except that it appears fertile and has extensive forests. In the said fort he (Quinn supplies �Grenville�) left 18 men and did not allow the said Po Diaz to go on land or to enter the fort. The said captain was there fourteen days and left in the said fort 4 cast-iron artillery pieces and provisions for the 18 men for one year. In charge of them he left a master Cofar an Englishman and another named Chapeman. The reason that this englishman [these english (?)] settle there is it is said that (Begin p. 3 MS) on the mainland [1?] there is much gold and [2?] in order to pass from the north sea to the southern, it is said and understood that it is nearby and [3?] to make themselves strong by finding riches. The above said was done by the captain with his ships at full sail and they sailed ___?___ with the intention of encountering ships from the indies up to a latitude of the island of the a�ores. His men arrived very sick and some 34 died and from there (Azores?) he crossed to terranova and entered the bay of San Francisco, where he put the people on shore to refresh themselves and they (?) gave them fish to eat. And from there he left to return to the a�ores, this time about 400 leagues [abt 1279.92 naut. Miles, according to Hoffman] ___?___ and they sailed through the islands some eight days, where he took [captured] a barque with passengers from San Miguel to Tercera, poor people which he took with him, and the greater part of them died and a boy told them that there was a ship loaded with hides from Bahaya [Bahya?] at a small island that they call villa franca where they had been unloaded in order to careen [dar carena = turn over the hull for caulking and repair] the said ship. Because it was taking water and the english went there and loaded them on their ships. Being near San Miguel they sent a ship to la tercera which (meaning this ship) encountered another English ship which was chasing (lit.) a frigate from Puerto Rico and the two of them captured it. After this it (the ship with the hides) continued its voyage to its land, where it arrived the 26 of December of 86 and they had there [tubo alli] Po Diaz as a captive with guards along with the other christians (probably �catholics� in current Spanish usage) it carried, which were about forty, saying that they could not give information to any other except Po Diaz word (again meaning information) about the settlement and from there the said captain went to Londres, where he hizo (lit. made = took on?) people for the said settlement, which were 210 persons both men and women with whom the said englishman dispatched 3 ships in charge of a portuguese named Simon Fds (Fernandes) married in england a great pilot author and instigator of the settlement, who sailed for it around march of 87 from London and the said Po Diaz crippled stayed at the home and estate of the said captain. These ships arrived at the settlement and did not find the 18 men who had remained in it nor any trace [rastro] of them. And there they left the said people and returned (p 4 of MS begins) to england where the said english captain furnished and readied to ___?___ (Quinn says �pinnaces� = pinazas; the transcription reads pasajes = passajes. The line containing this word seems to be missing from the bottom of p. 4 of the photocopy of the original) in which to embark seven men and four women to the said settlement with supplies for the aforesaid, biscuit, meat and vegetables [legumbres = beans]. He sent them in the charge of captain artefaz (?) and for pilot the said Po Diaz with orders that he not see any land whatever so that the said Po Diaz not escape and thus they sailed their voyage to within 30 leagues of the island of la Madera, where they having spied a sail, one paseje being a better sailer went after the sail and thus the two pasajes became separated and the pasaje on which was the said Po Diaz, encountered a french ship, which overtook and boarded it with 30 men with whom they fought until there [either] died or were wounded the greater part of one side and the other and the pasaje conquered by the frenchman, which [then] sacked them and took what they wanted and left them with some englishman who begged on their knees that the frenchman leave them the said Po Diaz for without him they could not navigate and they would perish, [but] he on his part used so many arguments with the french that he not be left that they ended by taking him with them promising that they would put him off in the canary islands, and arriving there they would not put him on land with the excuse that there was too heavy a sea, he was taken to the islands of cape verde, where he begged the French to put him ashore and not wanting to do that they offered to leave him in the indies and they would give him the pinnace (here, pinaza for the first time in this document) of their ship and many clothes after they had loaded their ship. He, seeing this (their reluctance), in order to reassure them, said that he agreed and he pointed out a cape [cauo] pretending that Mati__?__ was from there and that there were many fish; and arriving to where he indicated, the said Po Diaz dove into the water and fled and escaped from the said french on the island of mayo where he was four months until a ship from biana (Quinn misreads as Biena) on its way to Brazil and on it he embarked to cauo berde where he arranged with pedro de santiago [passage] to cartagena from where he (Diaz) came to la habana. The month of march of 89 and at present he remains in it (Habana) [waiting] to go to Spain with the fleet. And the said Pedro Diaz has found out that the people who remained in the said settlement must be [ser�] dead of starvation and will have undergone very great need and risk (danger, this is Quinn�s interpretatiotn of �riesgo�). (At this point the paper seems to be cut. About a half line of longhand is illegible. Quinn, using a different version of the document[? ], begins a new paragraph here). . . I took the above account, from the aforementioned [Diaz], who will go to spain with a fleet, to whom I will give the dispatch of mine so that he go with it (p 5 of MS) to the Court and be recognized; and (Lorenzo supplies the following Spanish not visible on my copy: ". . . y su majestad y su real consejo de indias den acerca de lo que . . . " [. . . and his majesty and his royal council of the indies give according to what . . .]) . . . deals with the said settlement the order that is in the best interest to his royal service; moreover this man knows its navigation, and is accustomed to hard work he is a good pilot and is to be trusted, to whom I have assured that his majesty will do it [i.e., reimburse him?] and should he not do it I will make good from my own fortune the expenses he incurs from Seville to the court his stay and return. Under this word (my promise) I have his that he will go to the court with the dispatch that I will give him. Dated in habana on the twenty first of march of one thousand five hundred eighty nine. at the latitude of 36 degrees �.